We know already that the economic interest of the South cannot be fought for without a radical change in the practice of European democracy. This is also the case for the East, but again – for the Easterners the most acute democratic deficit is located in a different sphere than for the Southerners. The political rights of migrants are key. When we, leftists, speak of the European Union, we usually know what to say: the EU in its current form is not what we want it to be. The rich Centre is exploiting the poor South. There is a debt crisis caused by a defective common currency. Neoliberal EU institutions are perpetuating it by supporting banks and big capital against the common people, and wealthy societies against underdeveloped ones. Our imaginary here revolves around Greece: negotiations with the Troika, the OXI referendum, the humiliation of the Syriza government, Yanis Varoufakis and his – unfortunately slightly torpid – crusade to democratise Europe. Sure, this imaginary does a lot of good. It points to a real problem: the Centre very clearly is an economic vampire sucking the juices of the South. It shows that economic dependencies within the EU, which go unnoticed for a long time, can within years push entire societies into poverty. Finally, it counters the shallow, unjust, and dangerous diagnosis of the crisis, based on national prejudices: the South is in debt not because of ‘the Southerners being lazy and corrupt’, but because it is a periphery, helpless against powerful economic mechanisms targeted at it. However, true as it is, this vision of the EU crisis has one massive limitation: it ends at the eastern German border. Thus, it completely ignores the fact that the European Union has not one, but two peripheries. Apart from the South there is the East: eleven former communist countries, mostly outside the Eurozone, with a population making 1/5 of the population of the EU. Just as much as the rich Centre economically drains the South, it also drains the East, only with the use of different mechanisms. This process for the moment goes almost unnoticed, blurred by other discourses about East-Central Europe: a region adopting semi-authoritarian regimes, sliding into institutional racism and forming a vague ‘home’ that some Western politicians would like to send their immigrants back to. Few realise that these phenomena are to a large extent just results of a deep socio-economic mechanism, pushing the East more and more into its position of a European periphery. This mechanism is not about debt and the Euro, but about the free movement of capital and people in the EU, and the difference in wages and social security systems between East and West. Abandoned during the transformation in the 1990s, consistently ignored as a political subject, workers in the East today earn several times less than their western colleagues, operate on an ultra-precarious and highly insecure labour market, and virtually never organize. Unsurprisingly, this encourages both local businessmen and foreign investors to run production and services in East-Central Europe based on cheap labour: call centres, store houses, factories producing simple sub-components. Needless to add that the profits are then to a huge extent transferred outside the region, to the headquarters of the foreign investors, or disappear without a trace in tax heavens. In order to stay competitive, the post-communist countries have to keep their wages low. And their governments are eager to push them down, blind to the needs of the general population and uncritically supporting the interests of the ‘national economy’, identical with the interests of capitalists. Thus, subcontracting and exploitation of workers is not, like in the West, a problem touching only parts of the society – it’s the very essence of how the eastern economies are organised, and how they are connected to more developed economies in the West. The governments in the East not only hardly realise the very existence of this mechanism, but in order to attract investors they compete against each other in offering them the cheapest labour and the biggest tax exemptions, thus making the problem even more acute. No wonder that Eastern Europeans, exposed to the damaged labour market at home, but given the opportunity to freely move to another country, prefer to emigrate to the UK or to Germany rather than look for a job in their own country. This has its consequences both in the East and in the West. The western European Left deals usually only with one end of this process, trying to oppose the rising wave of xenophobia against the Easterners in their countries. But while immigration is merely a straw man for the right-wing populists in the ‘Old EU’, emigration is a real and disastrous problem for East-Central Europe. Together with its neighbours further to the East, the new EU countries are the only region of the world which is currently depopulating. Since the beginning of the transformation, Romania lost 9% of its population, and Latvia as much as 25%, due to emigration and a cataclysmic fall in birth rates, also caused by the catastrophic insecurity on the labour market. After opening its borders to workers from the new EU countries, the UK attracted around one million people from Poland only. There is hardly any family in the region which would not be affected in one way or another by economic emigration. People leave mostly from small cities in provinces, which then, even if sometimes nicely renovated with EU money, look like scary ghost towns. EU funds were pumped into infrastructure, modernisation and superficial ‘revitalisation’ of public space, but without direct transfers raising the standard of living. As a result, EU money co-created an incongruous scenography of provincial life without perspectives, whose instability and hopelessness is difficult to notice from the outside. With half of the young people abroad and local workers striving to survive for less than the minimum wage and without any social security, social cohesion in these places died long time ago. If we compare different economic and social indices between the ‘Old’ and the ‘New’ EU countries, a clear discrepancy can be seen in most of them, but the most alarming divergence concerns indicators of life quality: public services, risk of poverty, life expectancy, etc., and of political subjectivity: trust in people, voice, accountability, satisfaction with democracy, etc. No wonder the populist Right is taking its toll in country after country. To counter migration, politicians both in the East and in the West reach for sometimes drastic, sometimes ridiculous – but never efficient – measures. Great Britain is leaving the European Union, Germany wants to cut social benefits for immigrants, while Poland used to fund scholarships for Poles who decide to come back to their homeland. Is there a chance that any of these moves will stop millions of people from travelling abroad? To counter a process as powerful as that, we must tackle it where it begins – at the European level. This is the task for the Left, if it really wants to radically renew the EU and make it a democratic and truly just structure. 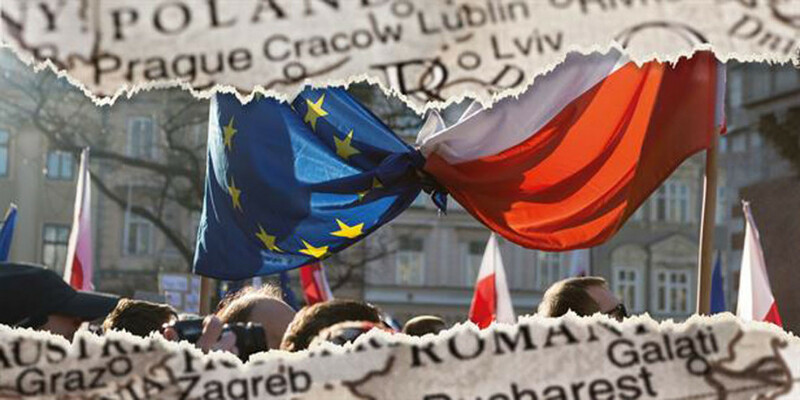 It is key to realize that something like a regional East-Central European interest within the EU actually does exist. It is not, as the new Right in the region likes to imagine, an interest of a group of nations, based on shared ‘traditional culture’ and historical experience, but a common interest of workers with similar life experiences and a similar fate across all countries of the region. The Left in the region is extremely weak, but if it is ever to grow, it must articulate the interests of the Eastern periphery on the European scene, just like the new Left of the South articulates the interests of the workers in Spain, Portugal, or Greece. Awareness is the first step, but it must lead to a positive political program. Yes, the Left must oppose what is wrong in the EU, but if it ever is to attract people to the idea of a renewal of Europe, it must give them tangible and concrete hope that change is possible. In an ideal world, the Left from the two peripheries could each work on a set of postulates, and then agree to support each other’s program. In this ideal world a forum for such an exchange would have to be created: for the moment maybe DiEM could be such a forum, or maybe other movements aiming at the renewal of the EU, or perhaps we need an International of new Left parties? It is crystal clear that to undermine the mechanism draining East-Central Europe, we need to equalize wages and social security systems across the continent. And we can propose tools to do it, even just by lifting the usual economic repertoire of the new Left to the European level. This repertoire is itself often a variety of practical conclusions drawn from the demand-based economic theories of the twentieth century. These theories were all built for closed economies – so there is no certainty they would work, if applied in one particular country, open to the globalised world. It is however imaginable that the EU, being a less open economic structure than single countries belonging to it, can in fact be the appropriate level to apply some of these postulates. What can they be? A European minimum wage, perhaps starting from different levels in different regions, but with a convergence mechanism built into it. European unconditional basic income. European direct investment stimulating regional development without transferring the profits to private pockets. European-wide trade unions. A complex and robust European social policy. European unified work standards and an institution overseeing them. All this calculated as thoroughly as possible, discussed within as many circles as possible, and turned into simple slogans, like “8 Euro for every hour of work”. We know already that the economic interest of the South cannot be fought for without a radical change in the practice of European democracy. This is also the case for the East. But again – for the Easterners the most acute democratic deficit is located in a different sphere than for the Southerners. The political rights of migrants are key. We see that the political crisis around migration in virtually all Western countries revolves around the exclusion of the newcomers from the shrinking system of social benefits and guarantees for workers. And yet, the masses of people around whom the debate revolves have zero say about themselves. They moved to their new countries pushed by economic mechanisms set in motion by the EU, they are EU citizens with a strong European identity, and yet their fate, their working rights, their access to social security systems – and recently, with the Brexit referendum, the very right to stay where they are – is decided above their heads, on the national level in the country they arrived in. Wouldn’t it be time to give migrants full political rights in their new homes, along with the old ones? To make residency, and not exclusively citizenship, the legal basis for voting rights, not only in local and in the European elections – but also in all national elections? Only with such rights can migrants emancipate themselves from the status of a human resource and become political actors. By formulating such a postulate, the Left of the Eastern Periphery would not only support the real interests of the people it wants to represent, but also practice – and not only theorise on – internationalism. The Eastern European new Left has a very long way to go. In most countries it exists in the form of intellectual circles rather than political forces, and if it acts politically, its impact is very limited. But it does exist and people on the Left looking for a way to engage politically observe and try to imitate the already existing movements in other parts of the world. And being inspired by Podemos’ internal organisation, Bernie Sander’s rhetoric and the economic program of the Scandinavian Left is definitely the right way to go. But what we cannot ignore and must emulate, is the way the Southern European Left understood how for many crucial problems an intervention on the national level is by far not enough and that they must challenge the European order. They haven’t managed to actually change much yet, but they did push through the regional interest of the Southern periphery as a topic in the debate about the future of Europe. If the Left of the Eastern Periphery can to do the same, and if we support each other in our struggles, ‘Another Europe’ can get a little closer and will mean a little more for everybody. Marta Tycner is a historian and member of the Polish Razem (Together) party.